For its latest offering, StrangeLove tapped Dave Carnie to collaborate on a special Christmas-themed Everslick board and zine. Fans of Carnie’s humor will certainly be rejoicing over this release. In honor of the occasion, Sean Cliver delves into the history of Everslicks on Strangelove’s blog, and provides some fascinating details about the rise and fall of slick-bottoms during their heyday in the ‘90s. Where Santa Cruz fucked up with the Everslick™, though, was adhering to a sense of proprietary pride in their innovation with strict logotype branding across the board on all boards in the first year out, thereby sacrificing any graphic fun in the process*. So I can’t really say the whole slick concept “took off” right away, or at least not until other companies like World Industries and Blind jumped on the train and derailed it to Funland by capitalizing on the ability to create full process-color continuous-tone graphics, e.g. 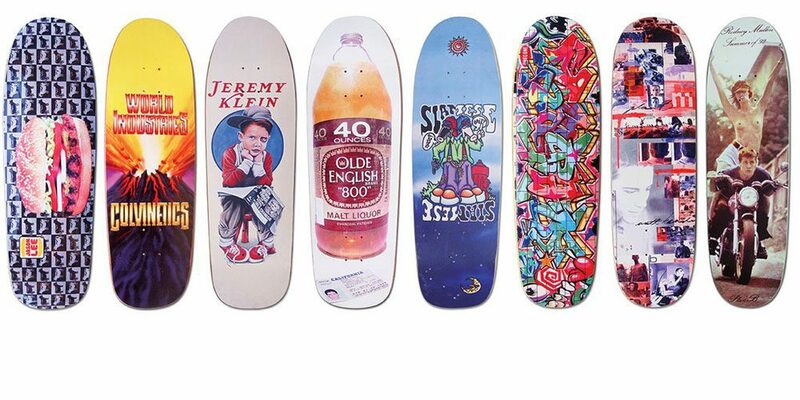 the Blind Jason Lee “Burger” board, Rudy Johnson’s “40 Ouncer,” the World Industries Jeremy Klein “Black Eye Kid,” Randy Colvin’s “Colvinetics,” and many memorable others. Suddenly slicks were a very big deal in skateboarding! But also a particularly heavy deal, because the plastic skin tacked on an additional eighth layer to the deck (more on that later). Regardless, every company throughout the industry in the early/mid ’90s started to pile on the plastic in their higgledy-piggledy board releases (calculated seasonal drops were still not a thing). Some even tried to finagle it into their own “unique” constructions and printing methods, but Jesus Christ… whoever thought that putting the graphic under a semi-translucent-if-not-kinda-cummy-in-appearance-condom-of-sorts was clearly (or unclearly?) out of their gourd. And while many utilized the new graphic medium for the betterment of creativity in skateboarding, it also enabled those with less than half of a wit to simply swipe imagery with little to no thought or effort whatsoever. Access to a flatbed scanner was all that was required to enter the slippery slope to market. Head over to StrangeLove to read the entire piece. The new Carnie board is also available now, and would make a fine gift for any skater this holiday season. Did you know that Christmas comes from mushrooms? Or that slicks come from space age polymer? Both are true according to the latest happenings at @strangelove.skateboards, where this new Dave Carnie, aka @acidinvader, board/zine full meal deal can be got while the holiday givings are good, and a new blog post by me myself can be casually consumed for toilet digestion. Link in profile!